All the hair care and treatment products your blonde hair needs in one 3-Step System formulated to correct, brighten and protect all shades of color-treated blonde, highlighted and lightened hair. 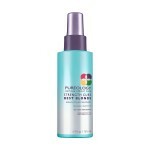 Pureology Strength Cure Best Blonde ConditionerCreated with violet toning properties, the Strength Cure Best Blonde Conditioner instantly conditions, detangles and tones all shades of color-treated blonde, highlighted and lightened hair. 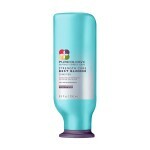 Formulated with the Strength Cure Asta Repair™, this toning conditioner for blonde hair moisturizes and restores hair by strengthening from root to top for shin..
Pureology Strength Cure Best Blonde Miracle Filler TreatmentDiscover soft and shiny hair again with the Strength Cure Best Blonde Miracle Filler Treatment. This daily hair treatment works best on all shades of blonde, highlighted or lifted hair and provides increased strength with continued daily use. Formulated with Stregnthening Keravis, this daily hair treatment helps heal and restore damange..
Pureology Strength Cure Best Blonde ShampooBring out your best blonde with the Strength Cure Best Blonde Shampoo for all shades of color-treated blonde, highlighted and lightened hair. Created with violet toning properties, this sulfate-free purple shampoo helps tone blonde hair and neutralizes and brightens ashy, brassy tones. 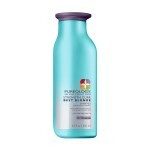 Formulated with the Strength Cure Asta Repair™, this purple shampoo ..